Last year, I noticed that Easter is starting to pick up steam in Japan. Baskin Robbins is definitely one of the biggest promoters of it. 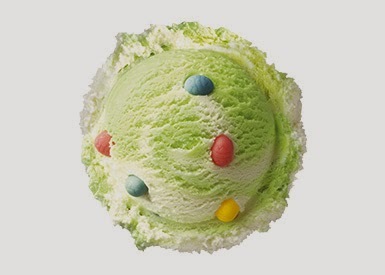 This year, they've got ice cream that will allow you to hunt for Easter eggs without having to do any of that pesky boiling, dying, and decorating. You can just hunt for them in your ice cream. The three colors of "eggs" (chocolate) are the only ones. The ice cream is, and this is where this takes on a uniquely Japanese bent, cotton candy and melon. Yes, the traditional Easter melon flavor. I hope it sells well for them. I wish I could try this flavor, I like melon. Not sure if I like it with chocolate though.